So when will the first one be held and how do you enter? Find out by joining us on Twitter, friend us on Facebook, or stop in, we’ll have a poster front and center at the counter (right where your winning name will be). YOUR NAME IN LIGHTS. OR, ON THE MENU BOARD. Starting this spring we will be holding contests to name our specialty drinks. We provide the ingredients, you conjure on the name. 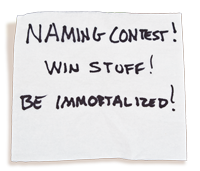 The winning name will be enshrined for all to see, and more importantly, you’ll have our gratitude in the form of a gift certificate, or apparel or another item of award-worthiness.